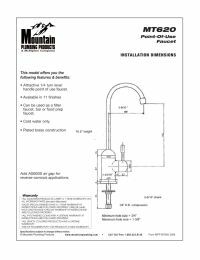 Mountain Plumbing Lead Free MT620 Point of Use Drinking Faucet is a cold water dispenser. The faucet can be used with many applications such as food prep, bar prep, and for use with filtration systems. It is available in multiple finishes which allows you to find the perfect design for your bar, kitchen or even bathroom! NOTE: While the brass compression fitting provided with this faucet will work with plastic tubing, we suggest upgrading to a plastic faucet connector. This inexpensive part will provide a more efficient leak-proof connection. For 1/4" OD plastic tubing you would use a 1/4" faucet connector for 3/8" OD tubing you would use a 3/8" faucet connector. Lifetime warranty on ceramic cartidge. 5 year warranty on plated finish. ; One year warranty on all working parts. Most special finishes have a one year warranty. ORB, EB, MHB, WCP and TB have a 90 day warranty. All PVD finishes come with a lifetime warranty. Instructions must have been followed properly to get warranty.